Deliciously sweetened with brown sugar, molasses, and honey, these baked beans have a nice kick with the addition of chipotle peppers and Bourbon whiskey. The secret to good baked beans is slow cooking! 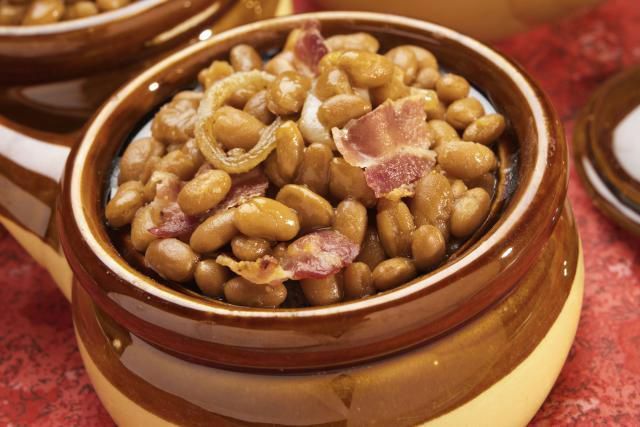 After 3 hours in a low-temperature oven, these beans are thick and rich! If you don't have that kind of time, just kick up the temperature and bake for only an hour. Still good. Preheat oven to 275 F.
In a medium bowl, whisk together the ketchup, brown sugar, maple syrup, honey, molasses, Worcestershire, chipotle and paprika. Place in oven and bake for 2 1/2 to 3 hours. Remove cover last 1/2 hour to allow beans to thicken and caramelize a bit on top. Stir well before serving. Note: You can speed up the cooking process by turning the oven up to 350 F and baking for only an hour. Still good but not quite as rich. Make Bacon the Easy Way - in the Microwave!